What's the most overpriced car? There are a lot of cars that have critical faults. They’re not abysmal like a Yugo. In fact, they’re fairly competent vehicles, doing an adequate or better job at what they should be doing. However, the critical fault always hangs over them, and that fault would be the price. 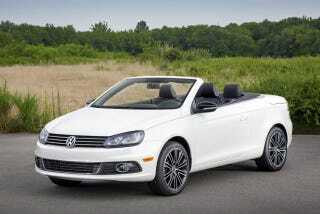 For example, let’s look at the Volkswagen Eos. It comes with a 2.0 litre engine that makes 200 horsepower and 207 ft-lbs of torque, has a leather interior, and all in all looks like a nice little cruiser for the everyman. Except it’s not for the everyman. Starting price in Canada before taxes or shipping is $42,990. That’s more than a Miata, Ford Mustang Ecoboost, the Fiat 500, the Beetle, and almost as much as a 2-Series convertible. Not exactly a great deal. Now, if this was closer in pricing to the rest of the Golfs, maybe at under $30,000 with a cloth interior, maybe it would be a good deal. But at that price? Crack pipe. So, what cars can you think of that cost more than you think they’re worth?